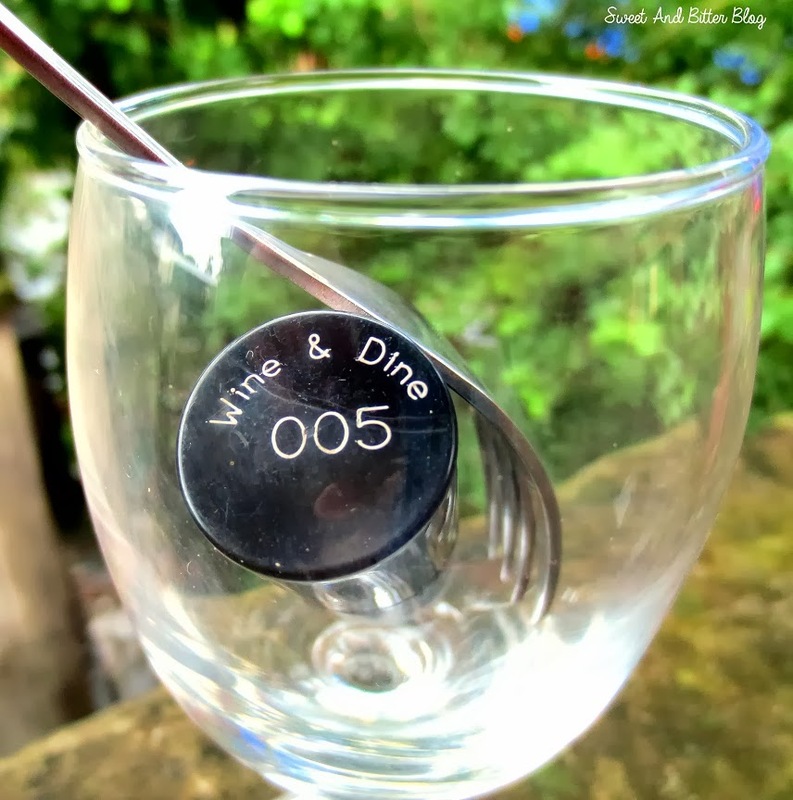 And........there are 40 shades to choose from! Just before the festival month, this is not something that can be missed. 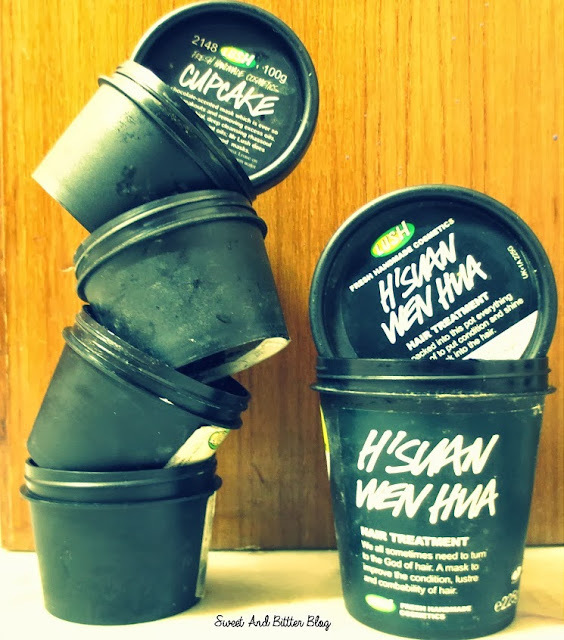 LUSH : Lush have a policy of giving you a free face masks if you return them 5 of their tubs or tubes. I just discovered that I successfully having my five tubs of Lush. I started using Lush products a little over a year ago and I am happy with them. Let’s see which mask I end up getting. Or, I might just get the trusted Cupcake face mask. MAC: Mac has a Back To MAC policy. You can pick any lipstick from their permanent range when return six M·A·C primary packaging containers. Just image getting Ruby Woo free of cost! You can choose any lipstick expect those from Viva glam as the profit from those goes to charity. I believe it will be easier to collect 5 packages of makeup removers and brush cleansers rather than lipsticks and foundation. 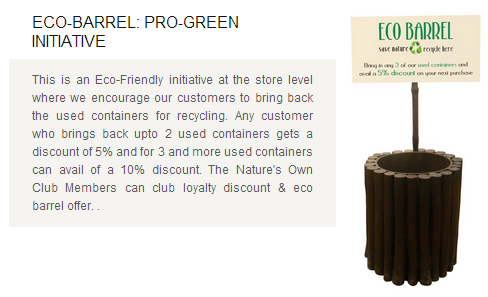 The Nature’s Co : they have Eco Barrel: Pro-Green Initiative as part of their customer engagement initiative. If you bring them 2 used containers then you get can discount of 5% and for 3 and more used containers you can avail 10% discount. This is pretty much easy to avail! I....Miss Shayoni.....never....even in my wackiest dream...thought that Maybelline will bring in Color Show in India. 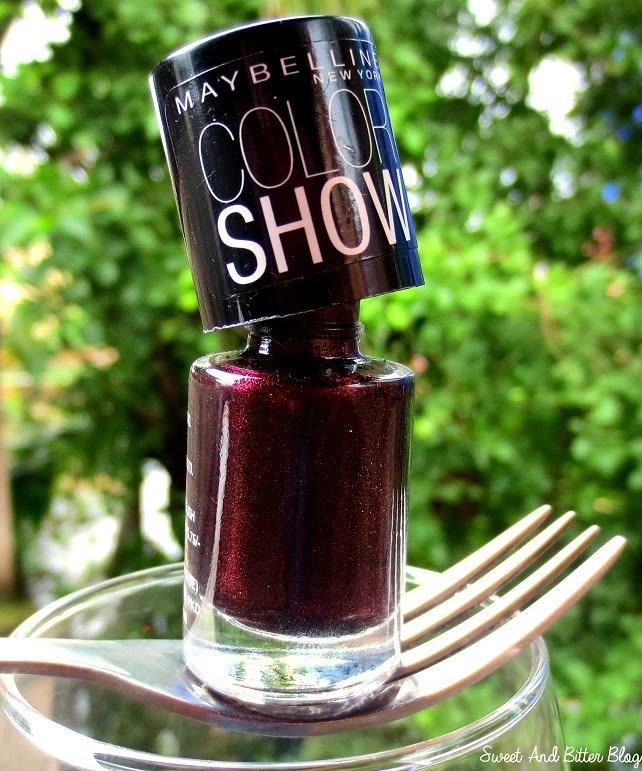 Because Maybelline already have the great Colorama range of nail polish ( For Your Info - I love them and own more than 15 of those ) and also because Maybelline have great variety of products which are never laucnhed in India. 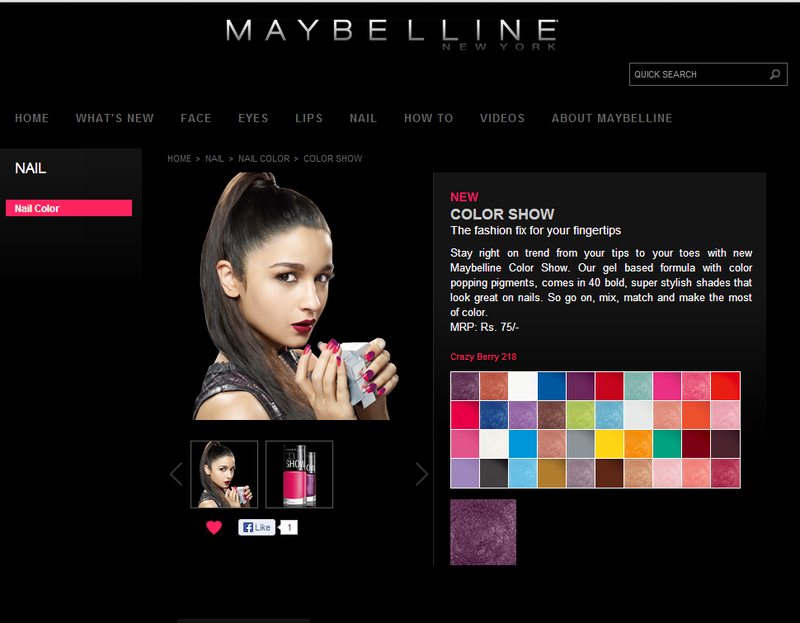 If you do not believe me then open the Maybelline Malaysia website and you will be in tears for not having that many products within your reach! 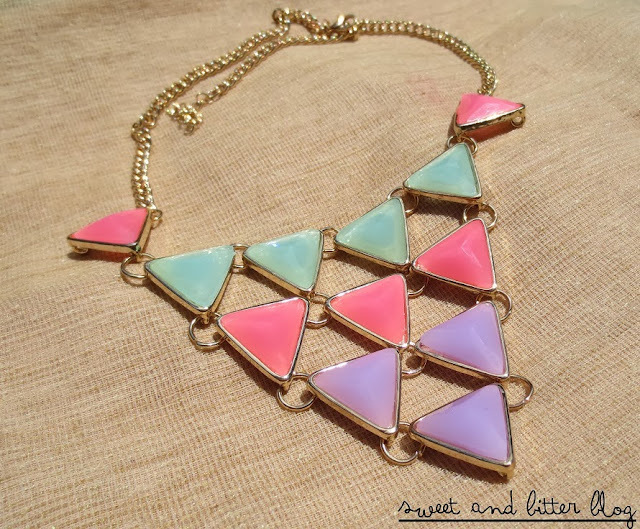 And the best part - total 40 color - at only 75 INR! 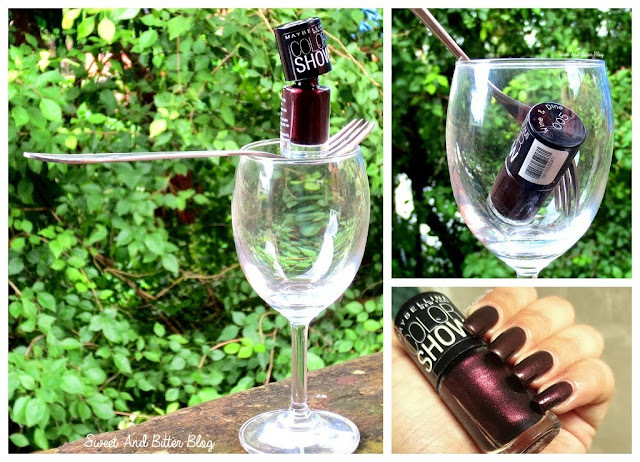 When every nail polish is charging anything above 100 for good color quality, this is hard to resist. 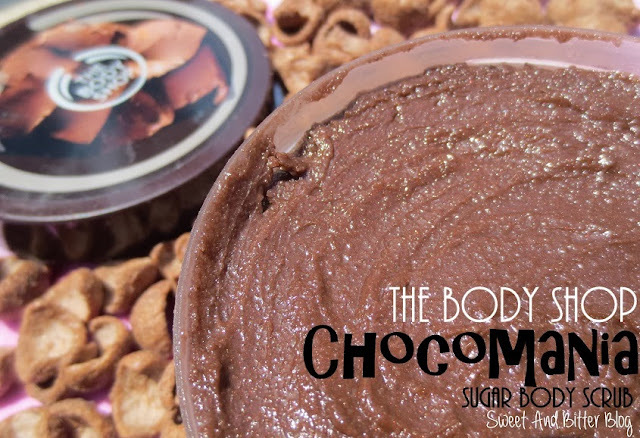 This exfoliating body scrub has a decadently chocolatey scent and leaves skin feeling softer and smoother. It contains real cocoa butter and organic cane sugar. Wear it, love it, but don’t eat it. HAUL : Collective Fashion Accessories Haul from Globus, Add Ons and Street! Collective Fashion Accessories Haul from Globus, Add Ons and Street! I am trying to go strong on no-makeup and more cloths and to some extend I am successful. Following month is the most festive month in east India and hence, shopping is at an all year high. Yeahhhhh to that! It is back at The Body Shop!!!! If you tried the Vineyard Peach last year and loved it as deeply as I did OR unfortunately missed buying the range then here is piece of news which will make you crave for juicy peaches. 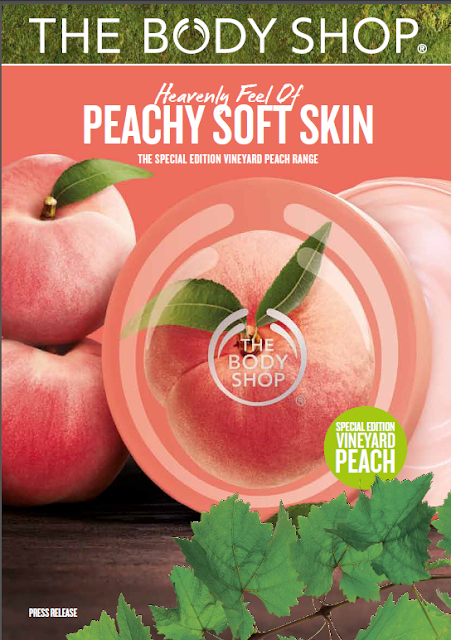 The Body Shop is back with the Special Edition Vineyard Peach. You asked us for it back… and we just couldn’t disappoint. Special Edition Vineyard Peach has returned by popular demand. Now that’s just peachy. This delectably indulgent body care collection quickly became one of our global best-sellers. And after receiving worldwide requests for its return, we knew Special Edition Vineyard Peach had to make a comeback just in time for summer. Bursting with precious peach kernel oil, Special Edition Vineyard Peach is a sweet delight for the senses. 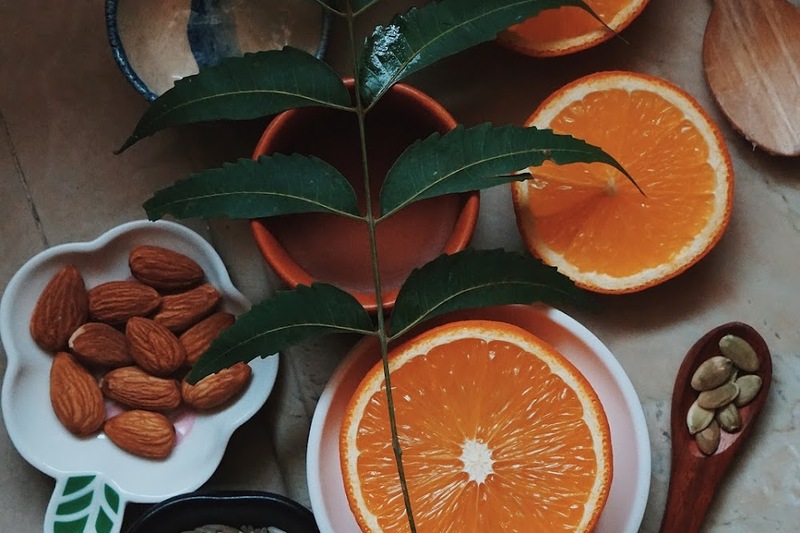 Its juicy fragrance, like freshly picked peaches, will transport you to the sun-kissed slopes of the Mediterranean where deliciously juicy fruit grow in abundance. And thanks to 24 hours of thirst-quenching moisture in our Special Edition Vineyard Peach Body Butter, you can enjoy the heavenly feel of peachy soft, velvety smooth skin all day long. Bliss! This lovely light lotion sinks straight in. Use daily for skin that feels soft and smells divine. Revel in the feel-good peachy fragrance as you lather up with our nondrying, soap-free shower gel. Scrub up! Containing ground peach seeds, this gentle exfoliator leaves skin silky smooth, soft and lightly scented. 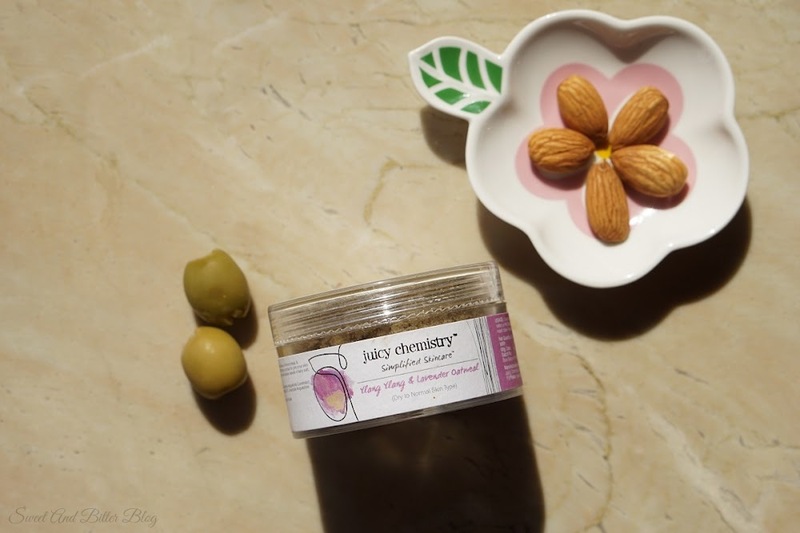 We think our velvety, creamy Body Butter is perfectly peachy-keen! Apply all over for 24 hours of deep moisturisation and peachy-soft skin. impact the lives of over 300,000 people and their communities every year. At The Body Shop, we believe true beauty comes from the heart. For us, beauty is much more than a pretty face. It’s about feeling good and doing good, too. We make our products with love and care. We source some of the finest raw ingredients fromthe four corners of the globe. 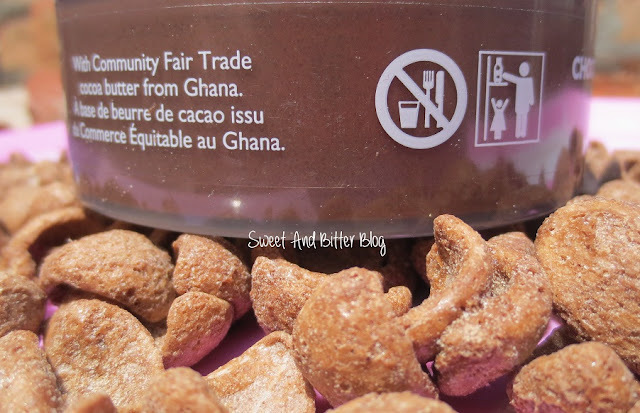 We harness the skills of artisan farmers and add our expertise to create effective products that are wonderful to use. We trade fairly so communities benefit as well as you. We never test on animals, and all our products are 100% vegetarian. We campaign with passion on issues close to our heart, because activism is in our blood. We always keep people, animals and the planet in mind. 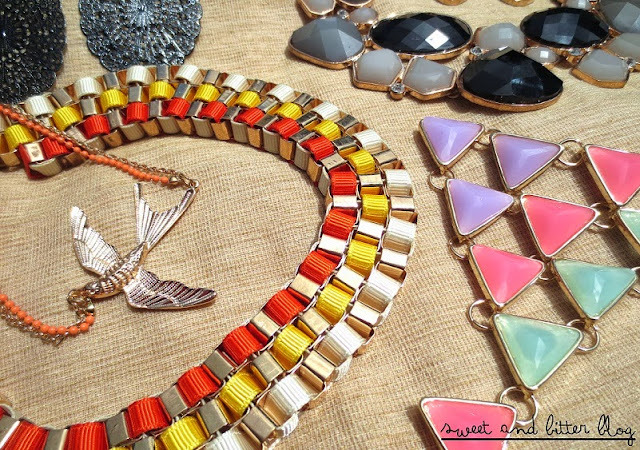 So when you shop with us, you are choosing ‘BEAUTY WITH HEART’. I have been going SLS free for shampoo for over 2.5 years. Sulfate shampoos irritated my scalp either from the first use or within a month of use, resulting into troubled scalp which gave way to hair fall. 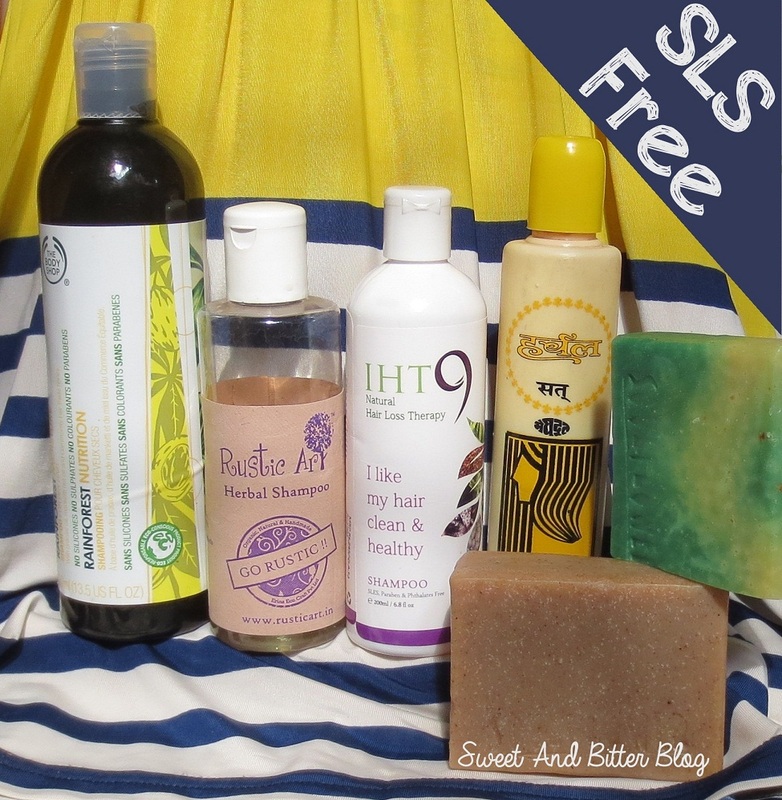 If you are not aware how much good what SLS free routine can do for you then I suggest that you please read this post. I listed down the SLS free shampoos available in India in the same post in February of this year. 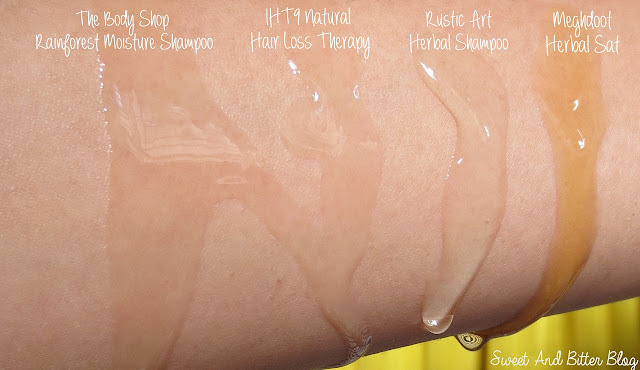 I have been using The Body Shop Rainforest Moisture Shampoo for a long time. I really like it. 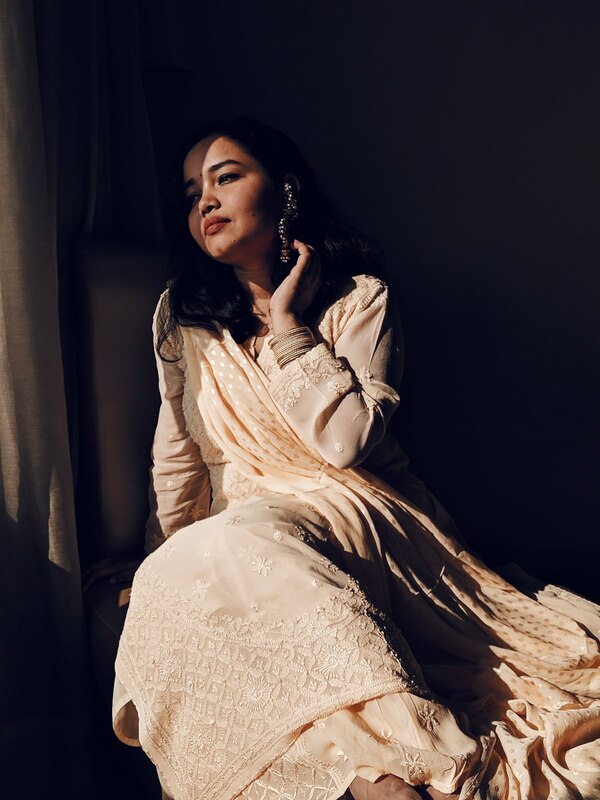 As one Sweet And Bitter Blog’s reader Rachna Daga once defined the smell as ‘honeyed floral coconut smell’. I will love to use this for the rest of my life. I tried IHT9 Natural Hair Loss Therapy but my nose did not agree with the smell. I could very hardly use it once. I found this drying but just one use does not make me eligible to judge this product. Then was the turn of Rustic Art Herbal Shampoo. This is thicker than the other two. Again found this to be drying for my hair. They also have a Aloe Shampoo which might suit my hair. Also, the product is tough to find just like IHT9 Natural Hair Loss Therapy. I got mine from Healthkart.com. I was already losing hope and I didn't want to lose. Soulflower Sandalwood Germanium Shampoo bar was up next. I grated it and mixed with water to make it like liquid shampoo. I was very happy with the result because it seemed to glide off my hair. There was not cleansing happening for sure. For some reason I decided to mix part glycerin with water and there wasn't much improvement in action. My hair was not receiving the TLC it deserved so, I thought of giving a pause to the experiments with my hair and going back to The Body Shop Rainforest Moisture Shampoo until my hair is under control again. So, I have not used the Soulflower Let Your Hair Down so far. Meghdoot have two shampoos variants – this one with yellow cap is the herbal one and another one with red cap that has sulfates. 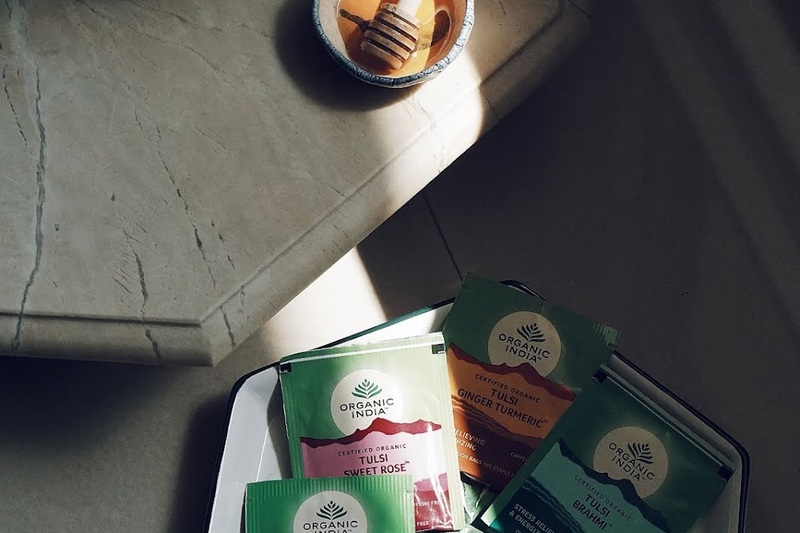 I got the herbal one and I am using it for a month now. The bottle says that you need to dilute this with water. Frankly this is the thickest shampoo. I have used it by diluting and later I started using it directly on wet hair. After a month of use – No dry frizzy hair, no itchy scalp, no hair fall, my hair feels lighter and interesting part and I have not idea how – my hair is straighter now! Maybe it is because the frizz is less. Best part about this Meghdoot Herbal Shampoo – This is priced at 42 INR for 150 ml. This has a powdery Sandalwood smell which is mild. This is available at most Khadi and Handloom stores in India. I will still explore more and more - Thanks to the lovely mails and messages with suggestions that I get from people who was also on a SLS free journey. What Do You Feel About Paired Watches? Mr. Boy’s 3 year old watch popped out a healthy and beautiful baby girl and I happily adopted her. Okay, I agree. Nothing like that happened. Mr. Boy suddenly discovered the pair of his own watch and then he had to gift it to be because I gifted him his watch. Why? Because F*ck logic. I have never ever liked pair watches. 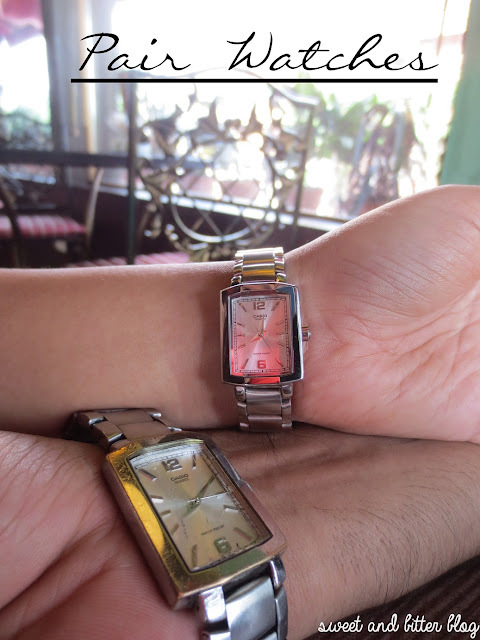 In Indian weddings, the bride’s parent make it a point to gift a pair watch to the newlyweds. Why? Because F*ck logic. I find paired watches unnecessary public display of affection. Maybe it’s just me who thinks so because I personally do not even like holding hands while walking! Not that I have problem with who do that because I find that cute. Why is this differentiation? Because F*ck logic. After I got this today morning (Mr.Boy was in town today for just 8 hours to meet me. At morning 6 he called to say that he is town. Surprise. Surprise), I was not sure how to act. All of a sudden I get the logic now! The Suddenly-I-See moment. As he lives 1500 KMs away from me, I cannot wear this as pair. But I need some change. Everyone is bored seeing me with my Fossil Rose Gold watch. 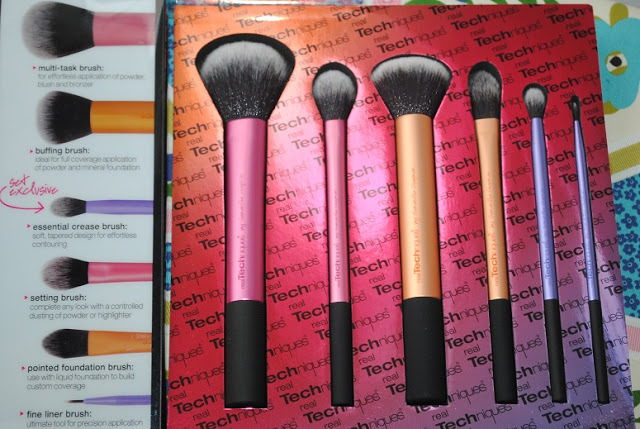 I always wanted to buy Real Techniques Brushes but was not sure which set to get. After lot of thinking, I decided on the eye set as planned here. But, I just found about this set which includes all favorites of Sam. Price info is still not out but less hope it is not more than 20-25$. They are set to launch in November so, I am skipping on RT brushes for now and waiting for this launch. Free Shipping At Sasa.com - SASA.com is having free worldwide shipping for 19$. Now, I am browsing their website. I am definitely getting something from Etude House. I have never used anything from them! Lakme have launched a Limited edition collection - Absolute Royal Range- inspired by the era of the royals to pay a tribute to the reign of princesses and queens. 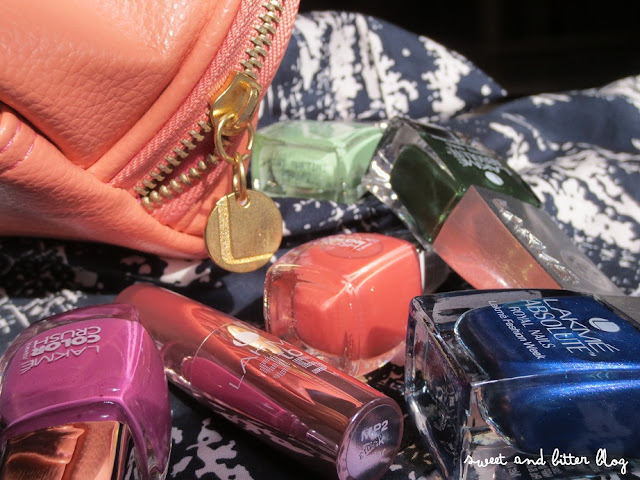 Being a lover of nail paints, I picked 2 from the 8 (well the store from where I picked them, had only 4 to choose from). 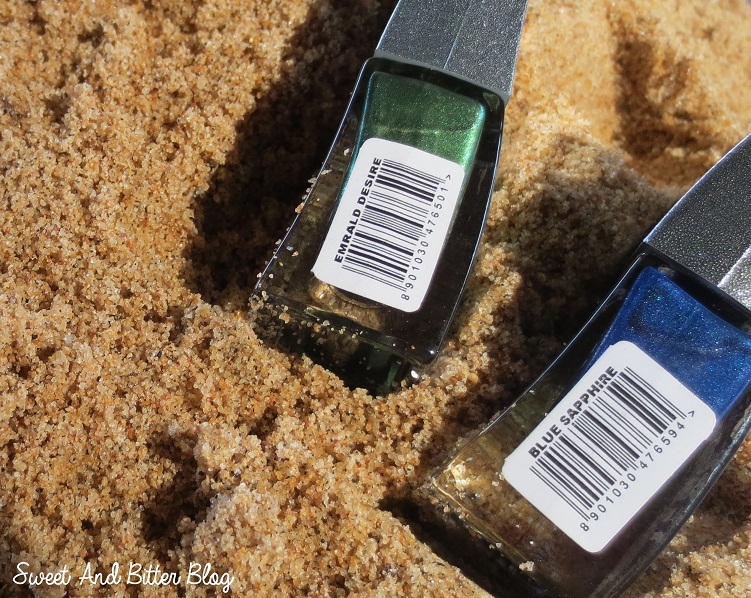 I choose - Blue Sapphire and Emerald Green. I have found the best SA in town! Hip Hip Hurrey!! Lakme 9 to 5 Lipstick in Pink Collar. Cute name, no? I wanted something peach and ended up with Pink because the options in non-shimmer formulas were limited. Lakme Royal Nails in Blue Sapphire and Emerald Desire for INR 250 each. 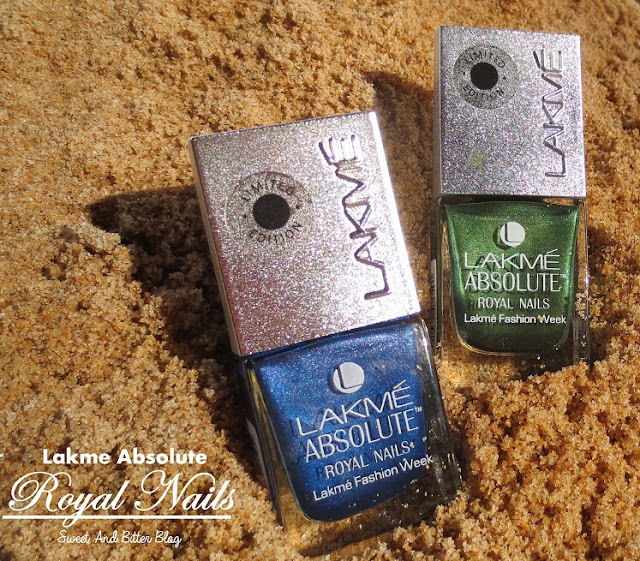 This is part of the ne Royal Collection by Lakme launched at the Lakme Fashion Week. 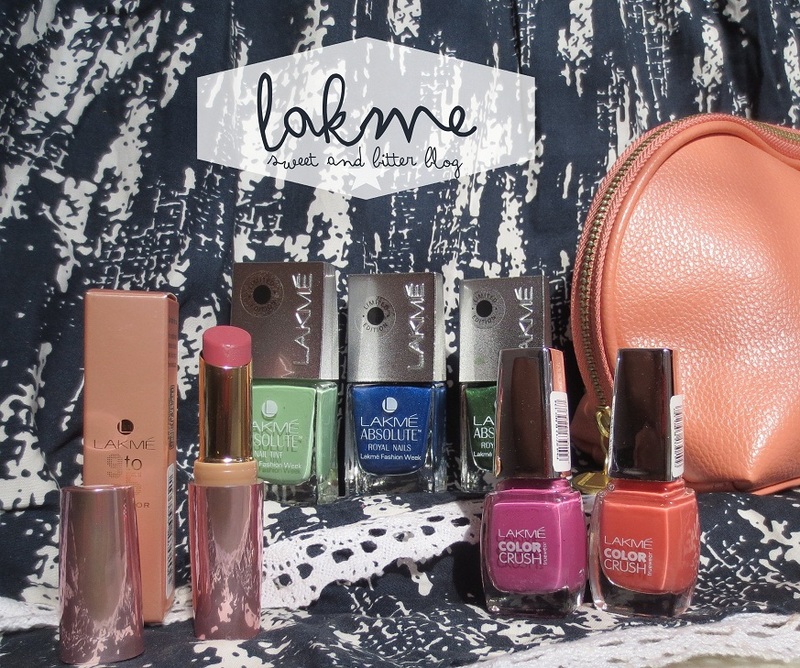 Lakme Nail Tint in Kiwi Martini for INR 250. 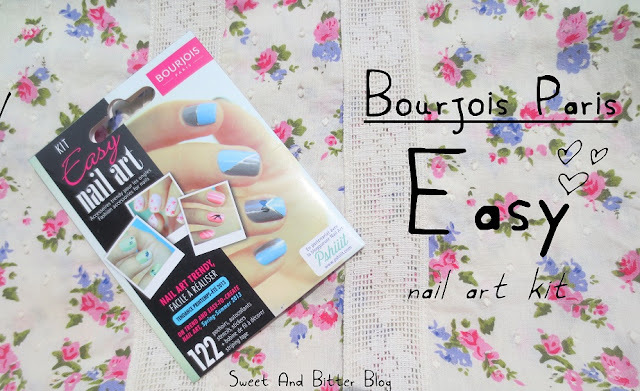 Will be shown in a nail art using the Bourjois Easy Art Kit. 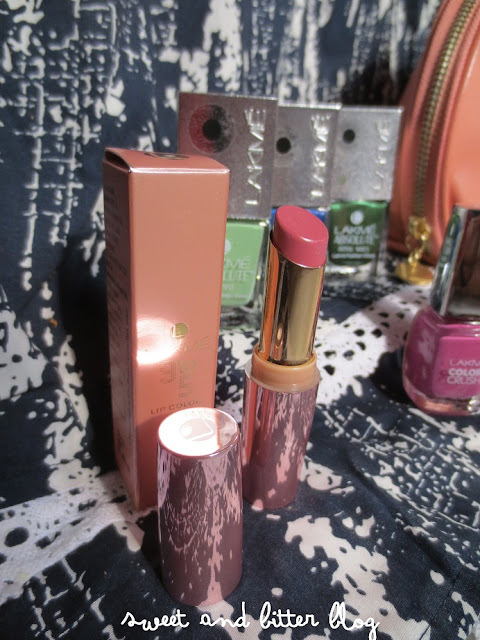 Lakme Color Crush – 19 and 29 for INR 150 each. Peach Makeup Bag for Free. 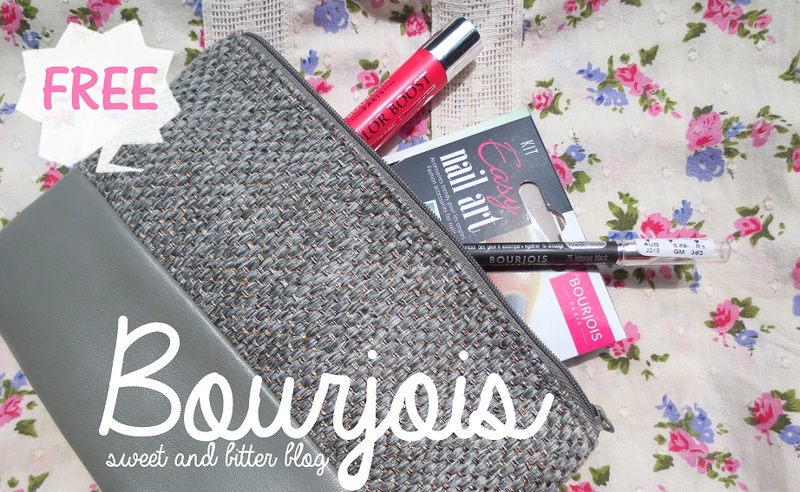 Bourjois Paris always surprises me with their products every single time. This time I was much pleased to discover them because I was not even aware of these! The SA just half-heartedly showed me these when I asked if there were any new products. And I as like - Yes Yes Yes!!!! 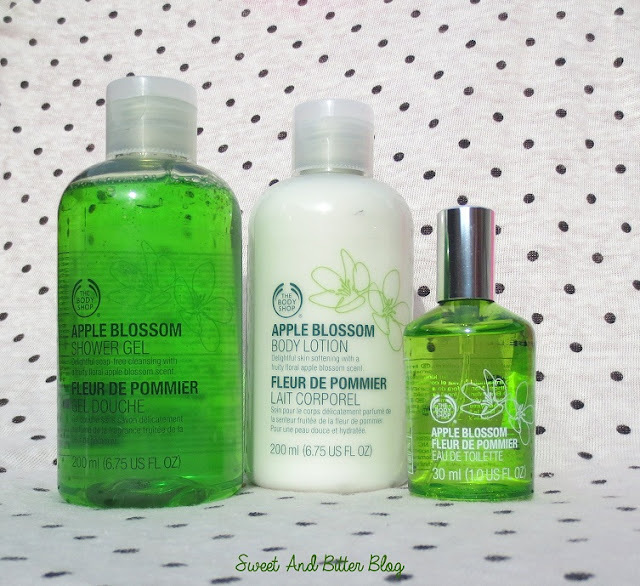 Look look look – Green Shower Gel! How cool is that? I don’t want to repent like I did by not buying the entire Vineyard Peach so, got the entire range....silly me?